The end and the beginning-- isn't that what all of us were contemplating this last weekend-- the end of 2017 and the start of 2018? For skiers in the Wasatch contemplating the 2017-18 ski season, it's difficult to see any beginning in sight. While I have logged 6 days so far, I still find myself wondering, "When is the season actually going to start?" Maybe some creative perspective is needed... some marketing spin. Through my rose-colored goggles, I've always thought of the calendar year as just one big ski season with an approximately 6 month intermission. So let's do some creative re-defining of what a ski season is and just call these "low tide" days a coda to last ski season. Let's see if that lifts our spirits any... not likely. Ullr doesn't appear to be in any rush to toss out the confetti to welcome 2018, so all I'm trying to do is make the best of the little snow Alta has. 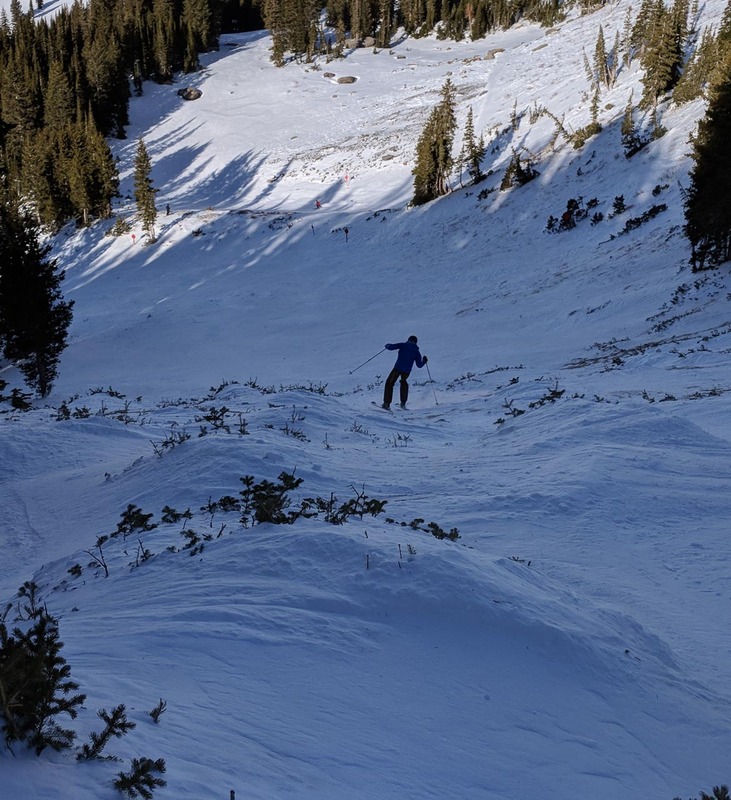 Doing so requires squeezing as much life out of my nearly 10 year old Line Prophets as I can, just so I can avoid exposing my Superchargers to the peppery traverses and bony runs that are frankly, the norm at Alta right now. It truly feels like the mountain is craving ski bottoms and P-tex like it's heroine. While I'm sure it's not a first, I don't ever remember seeing legitimate bootpacks up Jitterbug or East Greely just to get at some decent snow on Stonecrusher or Eddies. 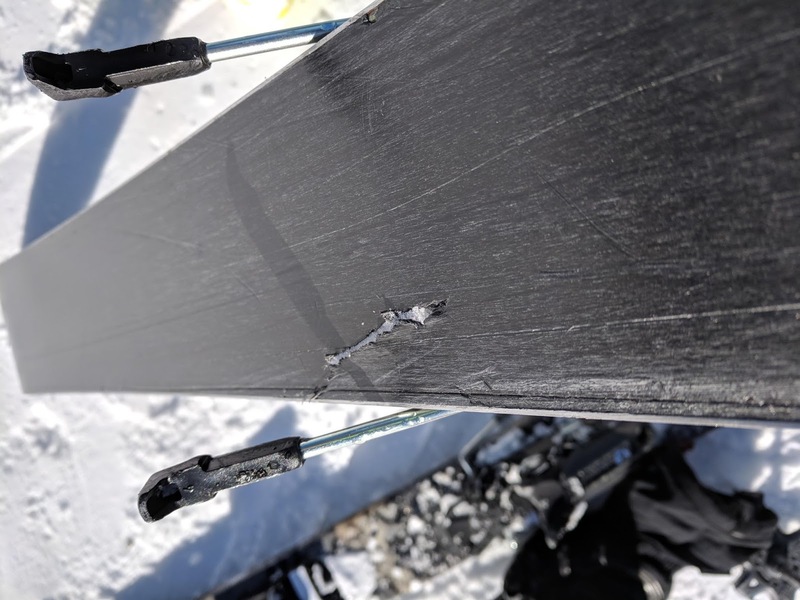 "Oh that will buff right out"
After my rock skis took a particularly nasty gash that created a keel-like snag of HDPE that acted like a rudder, I decided to actually spend money on tuning my sacrificial skis rather than try to tune them myself. I was hoping the guys at Alta Ski Shop could resuscitate what little life was left in my boards, especially because it looked like I might be skiing them for at least another month. Their prognosis was grim. Years of base grinding had left the prophets close to the limit on what could be done-- any future welds might not hold in the now dangerously shallow bases. I had them work their magic anyway. It pained me knowing that these skis, these trusty, non-rockered Prophets, which have served me so well, were giving everything they had just to buy my precious, less than a year old, Volie Superchargers a little extra time. The Prophets are certainly earning a Jedi farewell for their transcendental effort. But, let's not forget the upside, the "end-of-life" for a pair of skis always brings with it a happy beginning: the spousal justification for another pair of skis! 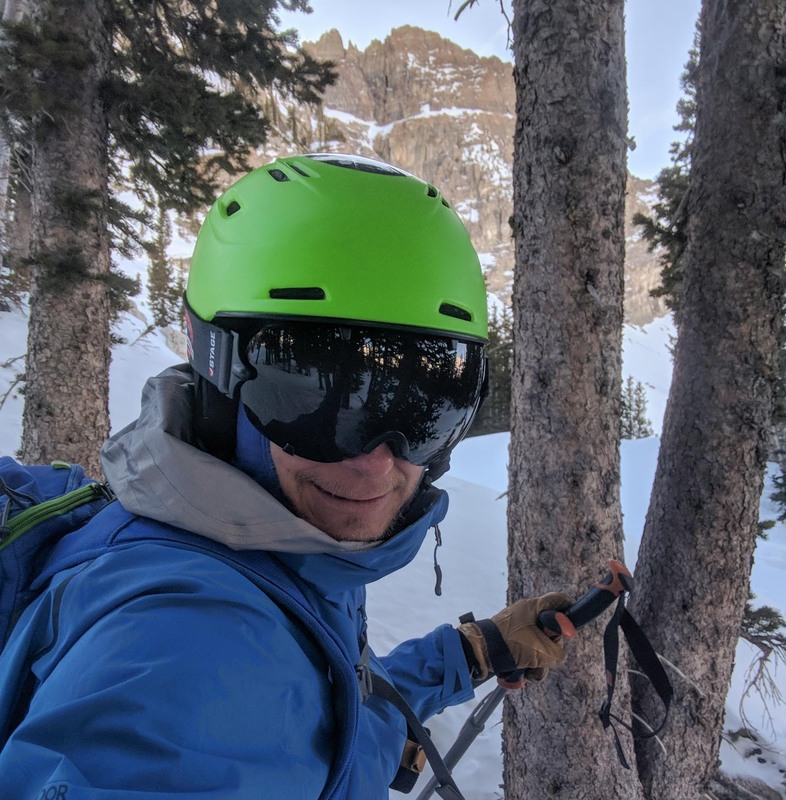 So I guess it was fitting that I spent the last day of 2017 trying to scrape as much ski-Nutella from the bottom of the Alta-jar as possible by skiing 25k on my rejuvenated Line Prophets. I didn't take it easy on them. A trip into Catherines, multiple laps across the Ballroom traverse that was starting to get a little "chocolate-chippy" and one rather sublime excursion into the Outer Limits under Devil's Castle. It was there, looking up through the trees at the geological medieval structure in the dimming afternoon light I recalled some absolutely ugly runs I used to make through the trees in my boyhood days at Porcupine Mountain, located in the Upper Peninsula of Michigan. After most of those runs, my jacket would be covered in tree sap, my shins and arms were battered by saplings, and of course, my edges were dulled by both vegetable and mineral. Yet I loved it... I was skiing. Those were the things I did to entertain myself on those characterless, cloned slopes of midwest ski resorts. Skis, sadly, are a disposable item. When I checked the Prophets at the end of the day, they hadn't taken any major damage and looked like they would live to fight another day. Skis were made to ski, not stay protected on the groomers. Like a Jedi would say, "Ski or ski not, there is no try [to save your bases]. While I wrote this, I unintentionally had two bi-polar songs playing, "It's Not Dark Yet" by Bob Dylan, in which he sings, "It's not dark yet, but it's getting there," and "All Things Must Pass" by George Harrison. Let's hope the latter turns out to be the anthem for this season. I have a love of skiing, cycling and writing. The evolution of skierSSummit.com could be traced back many years to when this cheesehead put skis on for the first time and snowplowed down a frozen mound that barely deserved the title of "hill". Since that "Weeeee" filled day, most of my outdoor bliss has been a product of the mountains. Here I share the dharma of the mountains and hope that even if I'm not informing, I'm at least entertaining. I'm not writing for resort promotion, I'm not writing to convince you what gear to buy (although I will give you my honest opinion of what I've used and abused) and I'm not writing for self-promotion. I'm instead narrating my story of recreating in the west and the passion I have for preserving the sanctuary of nature.